TORONTO, June 11, 2012 – Yeabsra Gebeyhu Hailmarim has undergone her fourth and final surgery today at the Toronto’s Hospital for Sick Children (SickKids). Transforming Faces (TF), a registered Canadian charity dedicated to closing the gap in cleft care for children in developing countries, would like to extend its’ thanks to SickKids, the Herbie Fund and members of the community who have supported this little girl’s transformation. Yeabsra attends Herbie Day on June 8 and takes her own portrait. “Yeabsra is one of many children whose lives are transformed through our work. This care is life-changing. It means she can attend school, play, and have a normal life,” said Esteban Lasso, Executive Director of TF. TF first learned about Yeabsra in 2010 when Lasso visited Yekatit 12 Hospital, which has a multidisciplinary burn and cleft lip and palate unit that TF has supported since 2007, in Addis Ababa, Ethiopia. Cleft Lip and Palate is one of the most common birth defects in the world. In Ethiopia, a country of over 85 million, an estimated one in every 574 babies is born with cleft lip and palate. Yeabsra’s case was deemed to be too complicated for local treatment. The Herbie Fund covered Yeabra’s medical expenses, while TF’s “Jo Jamieson Fund” and generous donations covered travel and accommodation costs for Yeabsra and Aynalem Adugna, her mother. TF also facilitated attendance at a private school for Yeabsra and built networks with the local Ethiopian community so that they would feel at home in Toronto. Yeabsra, whose journey was featured last week as a part of the Herbie Series, and Aynalem have since visited Canada twice. 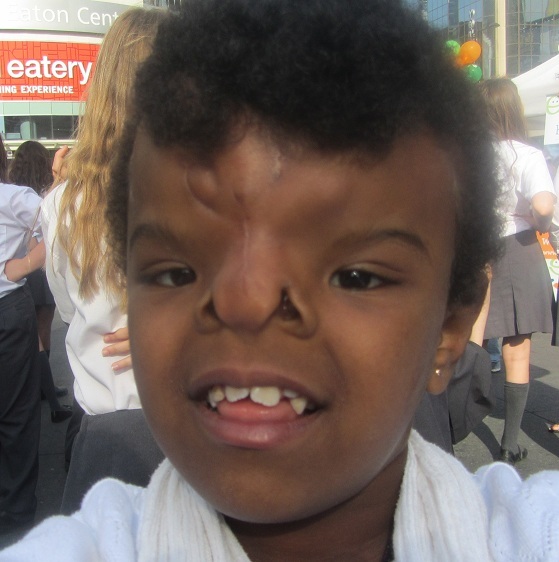 In April 2011, Yeabsra, Aynalem, and Dr. Mekonen Eshete, the Ethiopian surgeon who cared for Yeabsra in Ethiopia, travelled to Toronto where Yeabsra underwent a 12-hour surgery to repair her facial cleft. They returned to Ethiopia in June 2011 but an infection developed. Yeabsra, now seven years old, and her mother returned to Toronto in January 2012, where she underwent three surgeries – the first to repair her forehead and the last two to rebuild her nose. “The operations will help her have a better future,” says Adugna, her mother, who adds that she is very grateful for the corrective surgery. If you would like to help us close the gap in cleft care, please consider making a donation. A registered Canadian charity, Transforming Faces Worldwide provides access to local comprehensive treatment for cleft lip and palate and other craniofacial conditions. A private charitable foundation funds the charity’s administrative costs so a full 100 per cent of donations are used to provide direct services to children and parents affected by CLP around the world. TF’s “Jo Jamieson Fund” is a small fund which is designated for complicated cleft cases, normally involving craniofacial issues or associated syndromes. This special fund is made available for patients referred by TF partners and each patient is approved on a case-by-case basis. In 1999, Jo Jamieson, a Canadian international development worker, and Jackie Elton, a UK-based businesswoman, founded Transforming Faces Worldwide in Toronto. Download the Yeabsra backgrounder here.